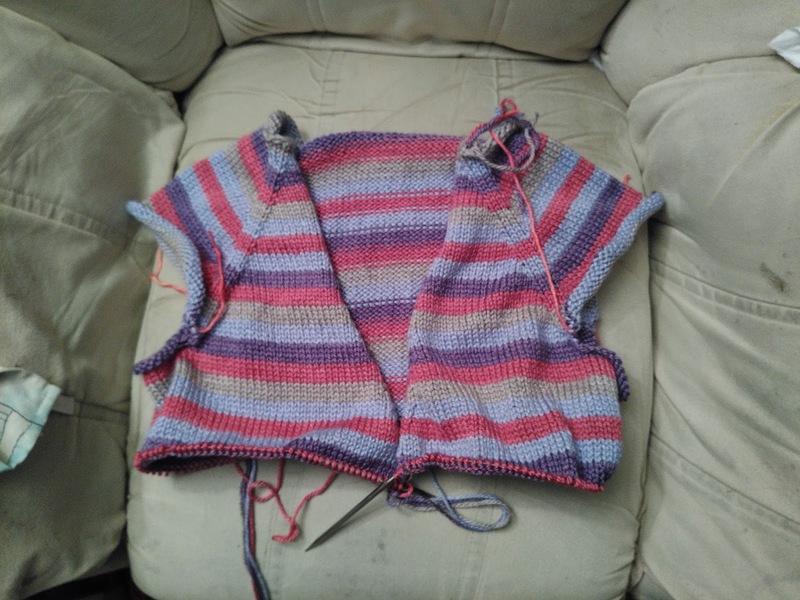 After it took me so long to finish the linen, I was worried that perhaps my interest in knitting was starting to wane. Turns out, I just needed something new. This is my progress since Friday AND I was out last night at a party and didn't get home until lunchtime today. I am quite impressed with myself: according to my calculations I am about half way finished with the body. Knitting stripes is very addictive, I think, because I am always thinking, "Just two more rows and I can start the next colour". And also, this is aran weight on 5mm needles so it does grow quickly. I've tried to be a bit strategic about the stripes. I have three skeins of the pink, two of the pale lilac and one each of the purple and the fawn. So, my stripe sequence is 10 stripes - three each in pink and lilac, two each in fawn and purple. I am crossing my fingers that I will have enough to complete the same sequence on the arms, with the extra pink skein to do the ribbing on the hem and cuffs, and the button band. We'll see. If necessary I could go with elbow length sleeves but this is a silk/merino blend so it's going to be too warm for the spring, I fear. Well. I'll cross the bridge if I come to it.